Pro Kabaddi 2018 Highlights, Haryana Steelers vs U Mumba, Bengaluru Bulls vs Tamil Thalaivas: U Mumba and Bengaluru Bulls recorded wins. Pro Kabaddi 2018 Highlights, Haryana Steelers vs U Mumba, Bengaluru Bulls vs Tamil Thalaivas: Haryana were taken apart by Mumbai in their previous meeting. Pro Kabaddi 2018 Highlights, Haryana Steelers vs U Mumba, Bengaluru Bulls vs Tamil Thalaivas: There is little reason why Haryana Steelers would be feeling happy about today’s match. The last time they met U Mumba, they were shredded apart and ended up losing the match 53-26. The 27-point gap was more than what they managed in the entire match and the highest win margin for U Mumba. They have a sturdy raiding machinery while the addition of Fazel Attrachali this season has worked wonders for their defence. Catch live score and updates of the Pro Kabaddi match between Haryana Steelers and U Mumba here. Siddharth Desai's six-point raid has been the catalyst in this and Haryana Steelers never recovered from it. Siddharth Desai becomes the fastest in Pro Kabaddi history to 50 points. Haryana Steelers simply not helping themselves by gifting points to U Mumba raiders. Siddharth Desai gets two points in one raid. He has now moved to 13 points. U Mumba are an incredible force. Not much in it for the raiders at the moment but Mumbai would be more than happy for the situation to remain like this. Six points remains the gap between the two sides in the early minutes of the second half. Just goes on to show how much of a difference that mammoth raid was for U Mumba. But, they are down to just two men in their half of the mat. Six point raid by Siddhart Desai took U Mumba's tally to 19 points. Suddenly U Mumba are in complete control. Haryana have come across a mountain to climb and it has come out of nowhere. This match has quite a different script from the one that went down between these two sides before. Haryana Steelers have got U Mumba on the ropes. Nothing to separate the two sides at the moment. Siddharth Desai and Monu Goyat both successful in their raids and so the two teams start on level terms. Still no win for Tamil Thalaivas after that opening match win against Patna Pirates. Thalaivas simply not able to get anywhere close to the Bulls. Sukesh Hegde had to be stretchered off and since then, Thalaivas have lost steam. 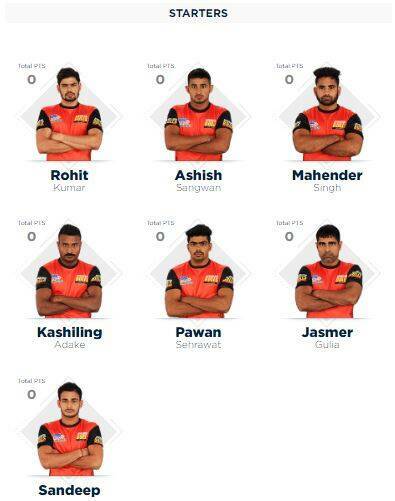 Thalaivas have come back a different team. Ajay Thakur has led their resurgence. Mahender Singh got a green card just before the stroke half time. 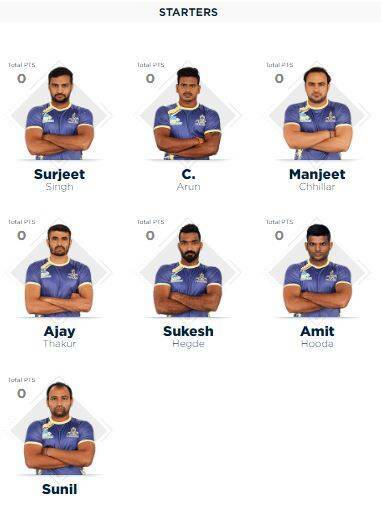 This has been Bengaluru's half through and through and Tamil Thalaivas have not shown any ability of coming back from this. So Kashling Adake had started this rout with a four-point raid on his very first attempt. Thalaivas have very rarely managed to get a single point out of raids since then. A Super Tackle helped them get themselves to six points. What a start from Bengaluru. They manage to inflict an all put within the first six minutes of the match. The defeat against Bengaluru Bulls was probably one of the toughest ones to take for Tamil Thalaivas among the four they suffered at home. It was an even contest for the first 10 minutes but that changed after Pawan stole five points from a single raid. Bengaluru just kept building on that and the crushed Thalaivas, no matter how hard they tried, remained behind for the rest of the match. They would hope that something like that does not occur again this time.